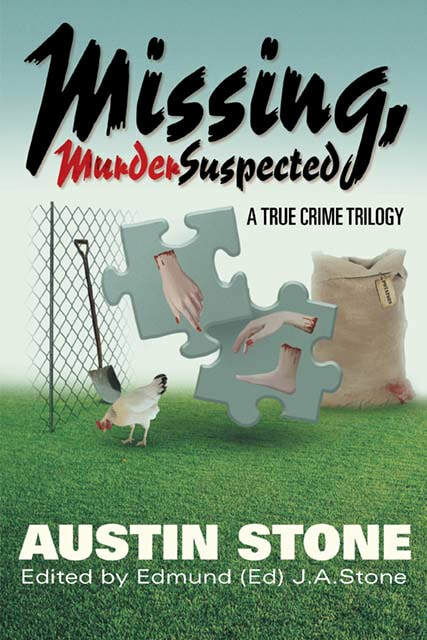 Missing, Murder Suspected is a crime novel based around a trilogy of true crime events. The first, “Love and Hate amongst the Chickens” was publicly known as ‘The Chicken Run Murder‘ of 1924, where John Norman Thorne murdered his fianc’e Elsie Cameron. The second, “A House of Horror” was also based on the true crime known as ‘The Buck Ruxton Jig-Saw Murders‘ of 1935. This crime involved the double murders by Dr. Buck Ruxton of his wife Isabella and her nursemaid Mary Rogerson. The third, “Four Sacks for a Shroud” is about the ‘Luton Sack Murder‘ of 1943, where, during WW2, a London fireman, Bertie Manton was driven into a killing rage by his wife Rene. Austin Stone (1904-1979) was a well known crime novelist and BBC playwright between the years 1936 - 1955. Most of his books and radio plays were based on historically 'True Crime' events and were published in several languages for his overseas readers/listeners. Prior to "Missing, Murder Suspected", his last published book in 1953 was "In the Shadow", a novel based on the 'Camden Town Murder' of 1907. This famous murder has since been possibly linked to "Jack the Ripper" by the well known American crime novelist Patricia Cornwell and also as depicted by artist Walter Sickert. Austin Stone in his Bugatti, Brooklands, 1926. He succeeds by some racy writing in shocking the reader into an awareness that murder is ugly and soul-destroying and that writers who have made it appear like a cross between an intelligence test and a treasure hunt have done a lot of us, including murderers, a grave disservice." "Mr. Stone is not only expert at propounding a mystery yarn 'of the first water', but also in lacing it with a full measure of thrills and chills." For questions comments and media enquiries, please submit the form below and Ed Stone, the son of Austin Stone and editor of Missing, Murder Suspected, will get back to you soon. Thank you! Listen to my Book Talk Radio Club interview with Claire Perkins. 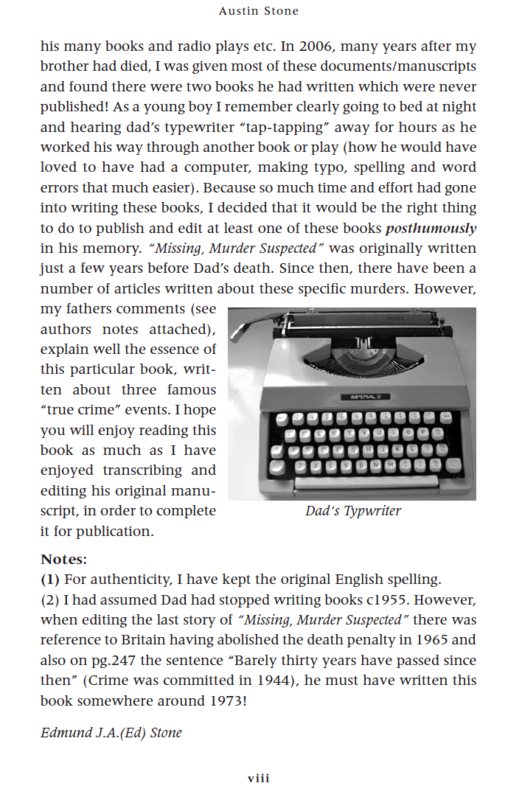 I talk about my Father Austin Stone, discovering the manuscript of Missing Murder Suspected and why I decided to publish it.